Human have a capacity to store information about what it feel in the past, what they heard, touch and smell. It is called memory. Time is something that you cannot take back, it is one way, like it or not it will always move ahead, leaving the time left by as memory and history. But, memories enables us (human) to feel that past time like it was yesterday, sometimes we feel very close to it although in reality it is very far away and cannot be reach back. The time you spend on the campus, with your friends will always catch you back even after centuries. Sometimes it give you some urge just to be with them again, feel it just one more time. 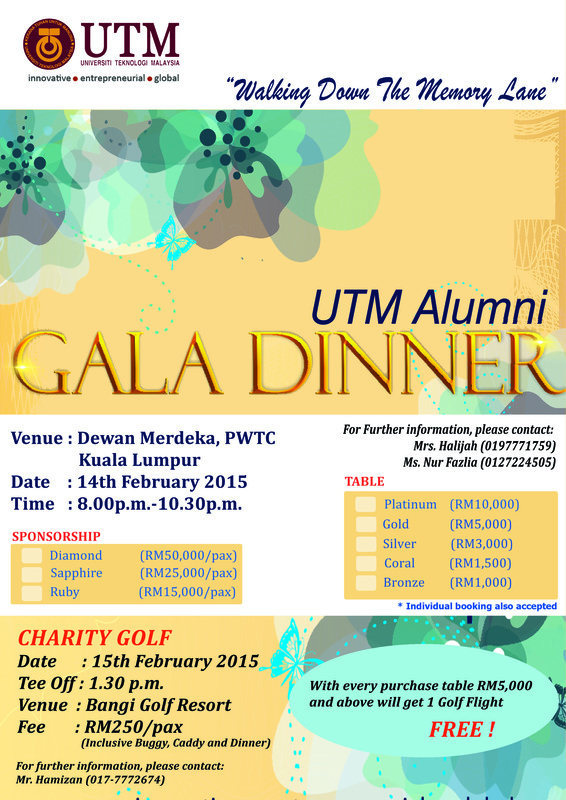 For this, UTM Alumni Unit is conducting Gala Dinner on 14 February 2015 at Dewan Merdeka, PWTC Kuala Lumpur. This is the time when you could meet again your friends and comrades, that once have fill a very special place in your heart. The place where you can meet back with your lecturer and supervisor that once have shaped you to be who you are today. For a short time, you have a chance to feel that lost feeling again. More info, visit utmalumni.my .